The incredible and inspiring story of Stephen Curry, the greatest shooter basketball has ever seen, and the ascension of the Golden State Warriors, a team on the verge of being an NBA dynasty, by long-time Warriors beat reporter and Bay Area News Group sports columnist Marcus Thompson. When it comes to Stephen Curry—point guard for the Golden State Warriors and reigning MVP of the NBA—journalists, fans, and sports analysts are running out of ways to say “wow.” Deemed too small and too short at 6’3 and 180 pounds by NBA coaches around the league, Curry has taken the game back from the bigger men who usually dominate the court. With his incredible shooting ability that started a “three-point revolution” he led the Warriors to seventy-three wins in the 2015-2016 season, beating out Michael Jordan and the 1996 Chicago Bulls’ long-time record. 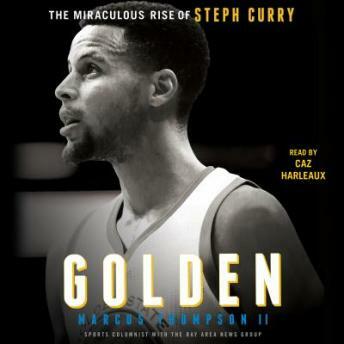 Told by Marcus Thompson, a lifelong Warriors insider who has been reporting on the team for twelve seasons, Golden is the definitive story of this singular talent. Thompson explores this all-star player, his love for the game and his team, and his close-knit and supportive family—including his Instagram celebrity chef wife Ayesha and adorable young daughters. From avid fans to newcomers of the sport, Curry has become a role model for both children and aspiring players everywhere. And he leads the ultimate team, a collection of talent and personalities that complement Curry’s game and push him to heights no one ever imagined for a kid from Davidson or this beleaguered franchise. These Warriors have carved out their place in history as one of the most memorable and transformative the NBA has ever seen. And they are led by a superstar who has solidified his place among the greats.